Tags: Beige, Jamawar, Semi Formal, Short Length, Teal Blue, Tulip Pants. Motif spray crafted all over the shirt. Shirt contains embroidered border at the bottom. 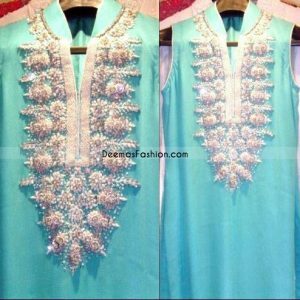 Dupatta crafted four sided embellished border. Work includes dabka, Pearls, tilla, stones, sequins, beads and resham and work.